Small, cool, and feature-packed, BOSSâ€™s new TU-88 is a must-have for guitar and bass players on the go. 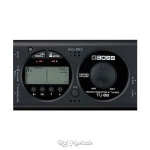 Available in black or white, it provides needle-accurate tuning, a metronome, and a headphone amp for private tuning, warm-ups, and effects verification. MIX IN allows jamming with an external music-playback device (iPod, etc. ).